Molly, a sophomore at Manchester, was diagnosed as a toddler with juvenile rheumatoid arthritis. After dealing with severe pain that limited her ability to be active, she was placed on a medication that greatly relieved her pain and let her do many of the fun things she was missing out on with friends. However, the medication may have contributed to her developing Hodgkin’s lymphoma in October 2010 at age 10. Molly began several months of chemotherapy at Akron Children’s Hospital that fall and winter. 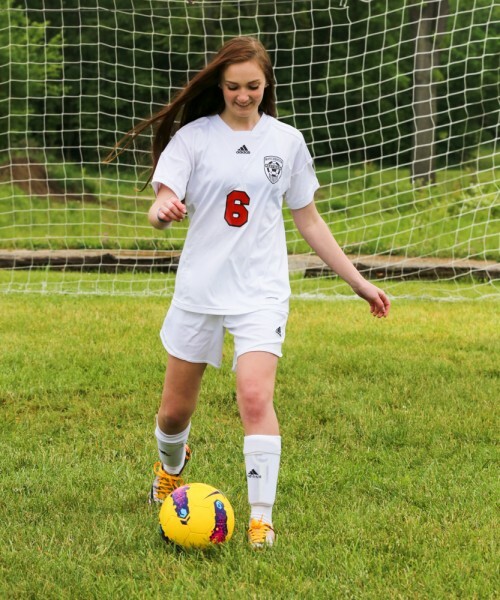 She was back playing soccer by April but the experience left her not only appreciative of her long-term relationship with Dr. Mary Toth, director of rheumatology at Akron Children’s, but also her care team in the Showers Family Center for Childhood Cancer and Blood Disorders. 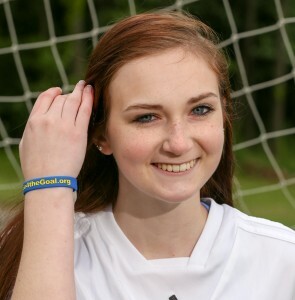 Molly is the 2015 athlete advocate for Akron Children’s 2015 “Lace Up 4 Pediatric Cancer” campaign, which gets into full swing in September during Childhood Cancer Awareness Month. Last year, Akron Children’s teamed up with Go4theGoal, a non-profit organization dedicated to helping patients with childhood cancer. The fundraising program is as simple as having athletes buy gold shoe laces from Go4theGoal for $5 each and 100 percent of that money goes to Akron Children’s cancer and blood disorders program. Dr. Hord would like to see the money raised this year create an adolescent and young adult cancer program, including redesigning some space on the hematology-oncology unit that would especially appeal to teens. Last year, more than 5,000 fall athletes from dozens of school districts participated, including soccer, football and volleyball players to cheerleaders and cross country runners. They bought the gold laces and dedicated games and meets as “Lace Up” events. Some contributed money from their ticket and concession sales. A few teams set up booths to sell laces at school. A troupe of Irish dancers, all wearing gold laces, posted a YouTube video of the performance. Akron Children’s Facebook post about the campaign generated nearly 85,000 “likes,” “shares” and positive comments. Molly is getting this year’s campaign underway. 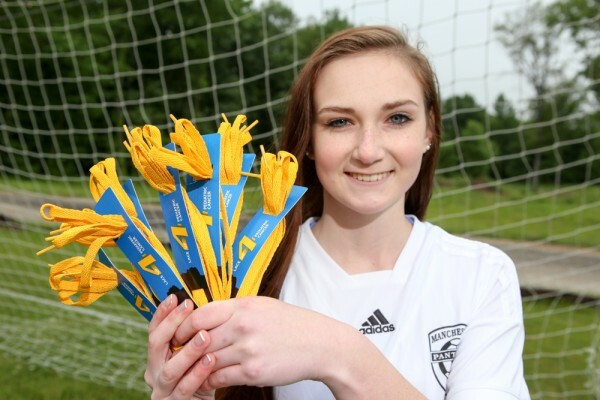 She’s leading the effort to get gold laces to her teammates and is also enlisting the support of Manchester’s football, volleyball, softball and cross country teams. The Manchester girls’ soccer team’s game against rival Coventry on Sept. 3 will be designated a “Lace Up” game. It’s easy to get your team involved. Just Contact Nate Mulberg at natemulberg@go4thegoal.org or 856-979-8384. Schools, teams and individual athletes who wish to create their own online fundraising pages may do so at donate.go4thegoal.org.